If you watched someone pour an entire beer into a pint of Ben & Jerry's Chocolate Chip Cookie Dough ice cream, you might wonder if they'd lost their marbles. 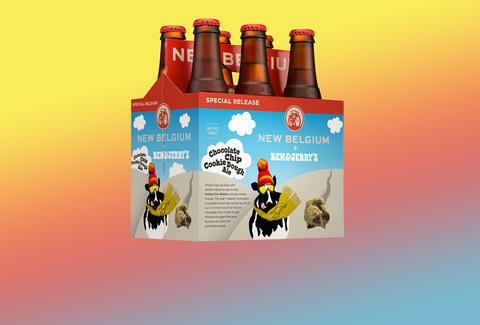 But apparently thinking of such crazy ideas is an actual job at New Belgium, one of the largest craft breweries in the nation, which teamed up with the ice cream geniuses at B&J to create the new Chocolate Chip Cookie Dough beer. We got ourselves a sample of the beer, which was announced in June, ahead of its October 31st release date in beer shops all over the country, and this is what it tastes like. One important thing to note: The beer's made for charity. Some of the proceeds from the 6% ABV ale brewed with chocolate and vanilla will be going towards the climate change advocacy group Protect Our Winters. The first beer these two companies partnered on, Salted Caramel Brownie Brown Ale, raised almost $100k. You can actually taste cookie dough! I've had a lot of Ben & Jerry's ice cream (and even 30 flavors in one afternoon, no big deal), and after I poured the beer and took a big whiff, I did inhale some slight chocolate chip cookie dough-esque flavors. But mostly it smells like, you know, beer. After my first few sips, I wondered how the companies could possibly call this a chocolate chip cookie dough beer. But it sneaks up on you. There are beautifully subtle cookie dough notes in the finish, but they don't linger enough to be annoying. This beer is not smacking you across the face with cookie dough notes, but I like that it doesn't. This is a beer I wouldn't mind pairing with some sort of chocolate cake for dessert. And besides, buying a six-pack helps charity. Basically, you're an Al Gore-style hero just for drinking this stuff. Lee Breslouer is a senior writer for Thrillist, and is waiting for a Chubby Hubby beer. Follow him to good ideas @LeeBreslouer.